Shingles is a viral infection caused by Varicella Zoster Virus (VZV) – the same virus that causes chickenpox. It causes a rash and pain along the area of skin supplied by the affected nerve. It can be easily diagnosed by any of our wonderful and affordable Private GP‘s, who can also help manage the condition. 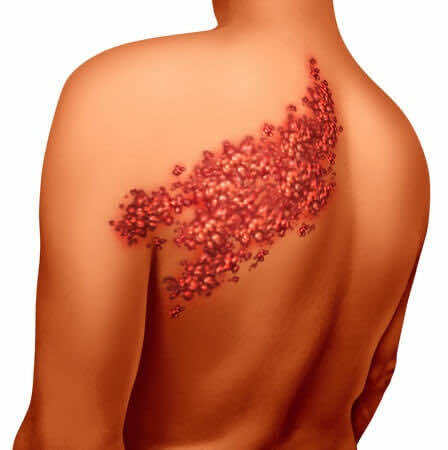 The two main symptoms of shingles are skin pain and a rash. The first presentation of shingles is a localised pain that is unexplained, there is no injury to the site of pain. This pain that is experienced varies from individual to individual, with different patients described sharp pains, tingling pains or dull aching pains. The severity of pain can vary from really quite severe to just a mild pain sensation. The area of skin in which the rash appears in is usually tender to touch. Eventually a rash develops and blisters form, which are often itchy. These blisters will flatten after a few days and become yellow in colouration. Often longer lasting damage can be caused to the skin, there may be long lasting decolouration or scars may form formed. A shingles rash will usually only presents unilaterally (on one side of the body), and distinctly will not move across the midline of the body. This is because the infection is of the dermatome – the strip of skin whose sensation is supplied by a specific spinal route nerve. The most common areas in which a rash will appear is abdomen and chest; however shingles can effect any part of the body and can much more serious if it is found around the eyes. Shingles Diagnosis: Should I Be Concerned? Shingles can last for between 2 to 4 weeks, and is not a life threatening infection. However, the earlier into the infection you see your GP, the sooner treatment can be started, and the less serious symptoms of shingles should be. How are Chickenpox and Shingles Related? As previously mentioned Shingles is caused by the same virus that brings about chickenpox. When the virus is contracted it remains in a dormant state in the nervous system, where it remains until certain triggers cause its reactivation. The exact triggers for Shingles virus reactivation are not known exactly, however it is suspected that having a lower level of immunity can cause the virus to be activated. However, even if you do not fall into one of these higher-risk categories, there is still a chance that you could develop shingles, should you be so unlucky! Shingles itself is not contagious to those who have had chickenpox before. However if you have not had chickenpox, then you are able to contract it from an individual who has shingles. The virus is spread through fluid or contact with open blisters. Therefore individuals with shingles or chickenpox are contagious until the last blister has dried and scabbed over. The only treatment for shingles is antiviral medication – acyclovir, valaciclovir and famciclovir. These medications can reduce the severity of shingles and can possibly reduce the duration of the infection. They will most commonly be prescribed to those who are in the at risk group i.e. the immunocompromised, aged over 50 or have shingles that is surrounding your eye. This is a severe pain that persists long after the rash has disappeared, causing a variety of pain. Postherpetic neuralgia sufferers often suffer from allodynia (where touch becomes painful) and hyperalgesia (heightened sensitivity to pain). This is where the virus affects the nerve around the eye. It can lead to complications of inflammation of the optic nerve that could lead to loss of vision completely. It can also cause glaucoma, whereby the pressure in the eye is raised which can cause vision difficulties and possible long term sight issues. So if you’ve noticed an unexplained rash, or any skin pains, and are concerned about Shingles, book a same day doctor appointment at any of our 8 convenient London clinic locations, for the swift diagnosis and treatment you may require.